We all would like to have healthy, strong, pain free teeth for as long as we live. One of the main reasons teeth cause pain is dental decay. Dental decay is, in the vast majority of cases preventable. Barbican dental centre would like to give you top tips for keeping your teeth healthy. Dental decay is caused when the enamel (hard white part of tooth) and dentine (lies under the enamel) becomes softened by acid attacks producing a cavity (hole). These attacks happen when the sugars we eat and drink react with the bacteria in our plaque producing acids. The attacks can last for up to an hour but our saliva can help to neutralise these acid and harden the tooth again. However eating and drinking to many sugary foods and drinks too often will not allow for the tooth to repair leading to dental decay and holes in your teeth. How can I prevent dental decay? The leading cause of tooth decay is poor oral hygiene and diet. Watch out for sugary and acidic drinks and juices even the ones that are claimed to be healthy have a lot of added sugar. Replace these type of drinks with water and milk especially in-between meals. Ensure to have regular check ups with your dentist, these visits will detect any early signs of tooth decay and can be treated with a filling. Leaving dental decay untreated will cause the decay to travel to the pulp of the tooth (underneath the dentine) which can only be treated with a root canal treatment (see root canal treatment leaflet) or even worse a tooth extraction (removal of a tooth). 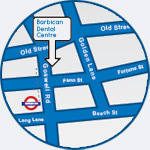 If you would like to see one of our dentists to help maintain your teeth or if you feel you have holes in your teeth that may require attention please contact Barbican Dental Centre on 0207 2533 232. Got a question and want to get in touch.